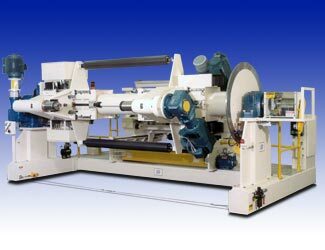 New Era manufactures a wide variety of winding equipment for web converting applications. 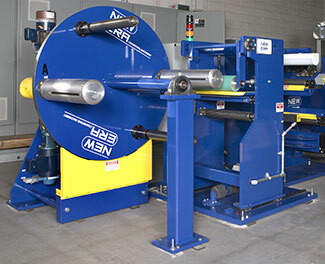 Our systems range from single position units to multi-spindle winders, can handle web widths from .5″ wide up to 20 feet wide and range in line speeds from 3000 fpm down to a few inches per minute. Our designs are custom implemented for your exact web materials and process constraints, providing you with a purpose built winding solution. New Era has multiple patents associated with winding, including an automatic, on-the-fly, zero fold-over winder. 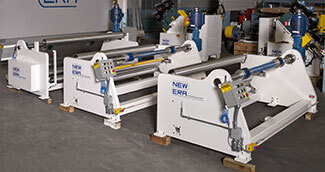 New Era builds a wide variety of turret winding equipment, all of which can incorporate a large number of features. Our manual cut and transfer turrets can be incorporated with accumulators so as not to stop the process while transfers are being made. Our more sophisticated systems offer fully automatic transfer technology at line speeds up to 3000 feet per minute. We can optimize these systems to your process, allowing for features such as no fold-over, tapeless transfers and a single strip of transfer tape on the core to minimize scrap. Our automatic turret winders can incorporate a variety of cutting knife technologies, allowing us to optimize the knife technology for your substrates. Each automatic turret rewind comes pre-programmed with fully automatic, semi-automatic and manual modes of operation. All of our turret winders are provided with automatic tension control and diameter calculation, and can also incorporate features such as shaft-less chucking of varying web widths, slitting, pack winding or gap winding, automatic guiding, built in pull rolls and tool-less changeover of winding modes. For customers operating roll to roll, New Era offers single position rewind equipment. These units can be incorporated with accumulators so as not to stop the process while transfers are being made. All of our single position rewinders are provided with automatic tension control and diameter calculation, and can also incorporate features such as shaft-less chucking of varying web widths, slitting, pack winding and gap winding, automatic guiding and built in pull rolls. Many processes dictate that multiple winder stands be incorporated into the web line. The necessity could be related to a stripping webs or winding liners separate from the product, or it could simply be required for staging a new core in order to reduce downtime while a transfer is being made. For these customers, New Era offers custom designed multi position winder stands. These units can be incorporated with accumulators so as not to stop the process while transfers are being made. Additionally, we can incorporate a variety of semi-automatic and automatic transfer mechanisms on these units to give you on-the-fly transfer capability. In addition, New Era has many proprietary winder designs which allow for features such as continuous pack and gap winding. With this type of system, the pack/gap roll travels with its associated winding spindle during turret indexing so as to maintain pack/gap winding throughout the transfer sequence. All of our single position winders are provided with automatic tension control and diameter calculation, and can also incorporate features such as shaft-less chucking of varying web widths, slitting, pack winding and gap winding, automatic guiding and built in pull rolls. For narrow width applications, or wide web, low bundle weight situations, New Era can custom design cantilevered winding equipment. These winders can be single position, multi-position or fully automatic turrets with on-the-fly transfers. As with the wide web turrets described above, these winders are provided with automatic tension control and diameter calculation, and can also incorporate features such as shaft-less chucking of varying web widths, slitting, pack winding and gap winding, automatic guiding, built in pull rolls and even outboard supports for use with heavier jumbo rolls. Our cantilever designs are such that most mechanical actuation and drive transmission components are located on the back side of the machine frame, presenting a clean configuration to the operator.